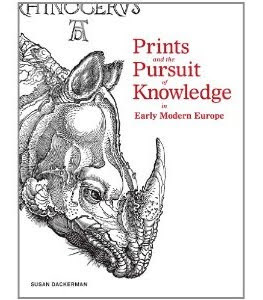 Prints and the Pursuit of Knowledge in Early Modern Europe is the catalog from a recent eponymous exhibition at Harvard's Arthur M. Sackler Museum. (The exhibition is currently on view at the Mary and Leigh Block Museum of Art at Northwestern University, Evanston, Illinois, through April 8, 2012.) Weighing in at a hefty 6.5 pounds and sporting an embossed reproduction of the head of Albrecht Durer's Rhinoceros on the soft-bound cover, this catalog delivers a fascinating look at the scientific technology of the sixteenth century and the celebrated artists who participated in it. Exhibition Overview: Prints and the Pursuit of Knowledge in Early Modern Europe from Harvard Art Museums on Vimeo. The flap prints by Heinrich Vogtherr the elder referenced in the video above were undoubtedly the high-tech anatomical representations for their time. To view them in a contemporary context, you can download a free app for your iPad or iPhone. The app lets you tap the image to reveal each of the flaps and provides an English translation for the text. For instance, if you tap on the "Matrix" flap you will learn that "the uterus is a vessel specified by God the Lord, in which the small children are received, nourished, and formed into a human body." 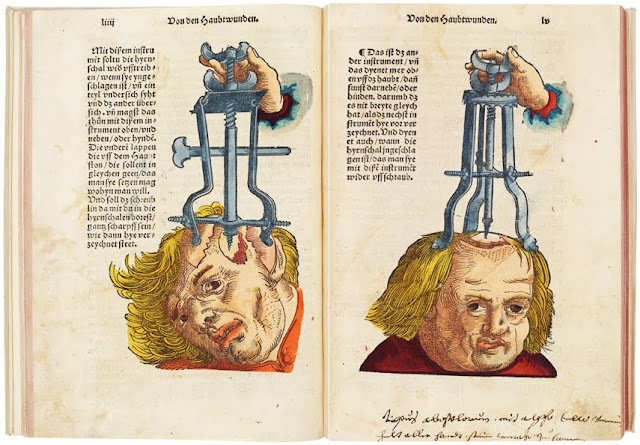 There are prints in the catalog that make you happy you live in the 21st century, such as Hans von Gersdorff and Hans Wechtlin the elder's Instruments for Use in Cranial Surgery, shown below. Hans von Gersdorff and Hans Wechtlin the elder, Instruments for Use in Cranial Surgery, in Gersdorff, Field manual for the treatment of wounds, Strasbourg: Hans Schott, 1540. Book with woodcuts with hand-coloring. Philadelphia Museum of Art, Purchased with the SmithKline Beckman Corporation Fund, 1949-97-11. Photo: Philadelphia Museum of Art. Other things haven't changed that much from the 16th century. 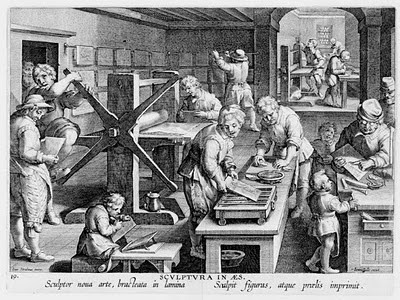 The Invention of Copperplate Engraving image takes me back to my printmaking classes at Otis, the main difference being the clothing and the absence of women. Unknown engraver, after Stradanus (Jan van der Straet), Invention of Copperplate Engraving, from Nova reperta (New inventions and discoveries of modern times), c. 1599–1603. Engraving. Sarah Campbell Blaffer Foundation, Houston, BF.1998.9.9. Photo: Sarah Campbell Blaffer Foundation, Houston. Among the most beautiful of the prints is Albrecht Durer's woodcut Rhinoceros. The following video explains the appearance of the fanciful second horn on the creature's shoulders. Object Discussion: Dürer's Rhinoceros from Harvard Art Museums on Vimeo. The 442 page catalog contains over 100 reproductions of woodcuts, engravings, and etchings; maps, globe gores, and globes; anatomical flap prints; and paper scientific instruments used for observation and measurement, each with accompanying text. Hours of delight, discovery and illumination are guaranteed. Megan Madzoeff: Cut it Out! Click on any book cover image below to purchase from Amazon.com. Offramp Gallery earns a small percentage from any purchase you make after you click (even if you buy underwear or auto parts). Thank you in advance for your support! Popup Books Meet Animation. Magic Ensues.